OLD TOWN, MAINE (July 10, 2015) — Old Town has expanded their lineup with the new Loon Angler kayak. This one-of-a-kind fishing craft is an evolution of Old Town’s original and extremely popular Loon that made its debut 20 years ago. Old Town will unveil their new Loon Angler at ICAST 2015, the world’s largest sportfishing trade show. 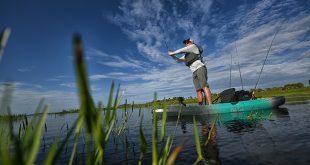 An exciting feature that’s exclusive to the Loon Angler is the innovative, removable workdeck that’s positioned at arm’s reach in front of the paddler. In addition to tackle trays and bottle holder it has a built-in storage compartment with a latched lid to keep gear secure and organized. The incorporated Slide Track mount makes it easy to quickly attach accessories. The workdeck also includes a USB port to keep phones, action cameras, hand-held GPS units and other electronics fully charged. The Loon Angler is a sit-inside kayak for anglers who want the comfort and shelter from the elements that an enclosed design provides. Both the 10’6” and 12’6” models are engineered with extra width and volume in the 3-layer hull for optimum stability, roominess and comfort. Adding to that comfort is the kayak’s Active Comfort System 2.0 (ACS2) seat that combines aesthetics, ergonomic comfort and performance. ACS2 features easy and intuitive adjustments, under-leg support, premium padding and flow-through ventilation, making it the most advanced kayak seating system on the market. For convenience and fishing efficiency, the Loon Angler has two integrated, flush-mount rod holders located just behind the cockpit. They’re perfectly positioned for trolling applications or to quickly grab a rod and cast. For storage of tackle and other gear, the kayak features bow and stern deck bungees and a rear click seal hatch with bulkhead.